After Rachel inadvertently sees George’s shrinkage, George gets his revenge on her by tricking Rachel into eating non-Kosher food – lobster – in the omelette he makes her for breakfast. Can George be in legal trouble for tricking Rachel into eating non kosher food? New York’s first Kosher law was struck down in 2002 as being unconstitutional, – the court found it to violate the First Amendment. The law had defined kosher as “prepared in accordance with the orthodox Hebrew religious requirements.” The 2nd Circuit Court of Appeals found the law be a violation of the Establishment Clause since it: (1) created an excessive entanglement between government and religion and (2) advanced Orthodox Judaism by specifically defining a word according to religious law. This, the court found, was a breach of freedom of religion. So could George be guilty of violating the New York Kosher Protection Act? It seems unlikely. Although George did sort of imply to Rachel that the omelette he had prepared was kosher, he never explicitly said that it was. When he asks her “you eat eggs right?” that certainly made Rachel think that there was nothing non-kosher about the eggs (eggs are eggs right? ), but George never explicitly stated that the omelette was free of lobster, pork, or other non-kosher animals. Therefore, since George did not try to pass off the omelette as kosher, he was under no obligation to disclose his kosher standards. Additionally, the New York law would not even apply to George in this case, since George is just making eggs at home and is not a commercial establishment that is selling food to consumers. Had George owned a restaurant and labeled certain dishes as kosher, or put a sign in the window that the establishment was kosher, then he would be legally obligated to inform customers who was certifying the store as kosher. 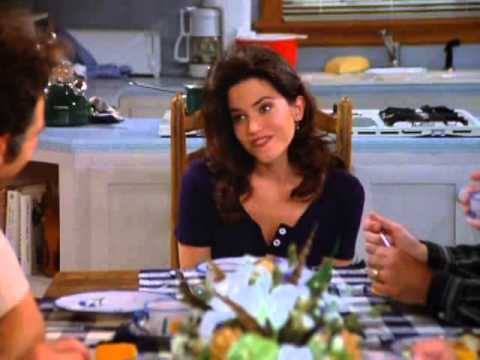 But tricking Rachel into eating lobster when she thinks there’s nothing non-kosher about her omelette will not land George into legal jeopardy for violating New York’s kosher law. Even though the traditional laws of kosher do not allow for the consumption of shellfish, pork or certain other animals, the New York law would allow for a restaurant to label itself as “kosher” and still sell those food items. This is because the law stops short of defining what kosher is, and only demands that the establishment tell consumers who is providing the kosher certification. So for someone like Rachel, who, according to Kramer, is going to get some special attention after she dies, then before she eats at a “kosher” restaurant she must check by who’s standards the restaurant is claiming to be kosher. Otherwise, she might find herself eating with a bib and her piety subject to some serious shrinkage. None of the food is kosher since it is being prepared in a non-kosher kitchen. The placement of non-kosher foods in the food is acceptable, and she never asked if there were non-kosher foods in the breakfast. if she were worried about it, should have asked before eating. Judgment has been rendered! Thank you for your comment, your honor.